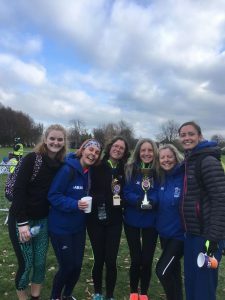 A group of Newmarket Joggers’ top female runners got together and launched a determined bid in the Bassingbourn Belle 10 mile race on Sunday, running away with the women’s first team prize, despite most of them never having attempted the distance before. The prize was decided by the top three placings of the team members, with Emma Newman coming home 1st in 1:14:16, 9th of 208 women overall. Ruth Eberhardt (1:17:05) was not far behind, 2nd of 71 in her F45 age group with a PB of over 4 minutes. Ellie Bithell (1:21:13) took 3rd place for the team, followed by loyal support from Danielle Jones (1:25:47 PB), Jackie Hall (1:26:22), Jan Holmes (1:31:54), Sianie Painter (1:37:42 PB) and Sarah Kinston (1:43:16). Competing for the men were Jeremy Reader (1:20:16) and Daryl Moran (1:35:27). Meanwhile, it was all the fun of the Ely Festive 5K with a huge turnout of 665 runners and walkers. Joggers Malcolm Osbourn (27:22), Iain Perry (30:09), Jenny Osbourn (34:13) and Carol Mcintosh (34:13) all put in sound efforts. Adam Maltpress ran the Ipswich MoRun 5K on Saturday 24th Nov and came home first finisher of 87 in 20:38, his best 5K time this year. The next day he completed the Hatfield 5 mile race in 36:58, adding to his tally in an attempt to run 40 races and receive 40 medals aged 40, ending next October. He has 10 races under his belt already, so is well ahead of schedule. Andrew Taylor (47:13) ran the Breckland Forest 10K on Sunday, finishing 18th of 167, while in the Hertfordshire Half Marathon at Knebworth House on 18th Nov, Paul Dockerill set a new PB of 1:28:47, coming an impressive 54th of 1,456 runners overall. newmarketjoggers.co.uk/london…. @HRC_RunningUK Places available on the Newmarket Joggers London Marathon Bus. newmarketjoggers.co.uk/london… @StowStriders @SudburyJoggers @suffolkcc Places available on the Newmarket Joggers London Marathon Bus!